I 2012 the rumor going around was that the Axis of the Earth was perfect for standing a broom up and it would stay that way. LOL.....I don't fall for that stuff but for the fun of it I stood the broom in the corner of the kitchen just to see how long it would stand. It was out of the way so it was able to stand for a week or so. 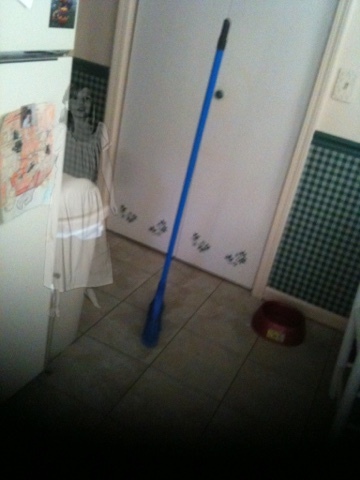 A couple of months later I ran across the pic I took of my broom standing on my phone. I had just gotten an app for Ghost Exposure, so I decided to play! See the ghost pic of the little girl? HAHA.....well I could not leave it like that. 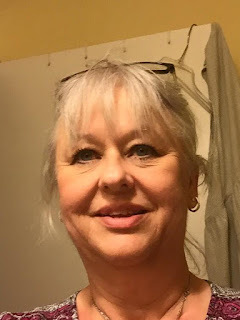 I have lived in my home for 25 yrs. I have no history of the home but I do know that it is haunted. Stop laughing at me. Anyway, I have always told my mom that it was so......after adding the little girl to the pic I sent it to my mom and told her that I took the pic the night before and the broom was still standing. I did not mention the little girl. The advantages to weight loss are weight loss! haha I am now off 4 meds. My liver enzymes are normal. All in all I am healthier. I can paint my toe nails. I feel bones I could not feel before. I can cross my legs. New clothes! But there are disadvantages also. I have to remember DAILY to take 3 multi vits a day 3 chewable calcium a day (total 1500 mg) a vit D a day and a vit B12 once a week. Because your body does not absorb vits like it used to. I can't take whole pills for fear of chocking. I have to crush them or take apart and sprinkle on my food. With the issue of absorbing vits comes hair loss. Right now by the handful. Dark circles under my eyes. Deep dark making me look sick. This is due to losing of fat and collagen. With all the advantages and disadvantages there was hope. I had heard for so long that changing the way you eat will help with fibro pain and issues. Yesterday I showed you the farmhouse bench I threw together in 30 mins. Today I spray painted it. I buy Valspar that has the primer in it so that is one less step I have to take. And now I have it in place. Love checking out the flowers in my garden. This plant esp. It is a Spiderswort. Becoming one of my favs. Peek a boo with the Cala Lily. Sometime ago when posting pics of the yard and gardens I mentioned that I would not post of the deck cause it was a mess. Well.....I cleaned it up a bit today. I had wood stored on there over the winter and I finally got it to the shed. 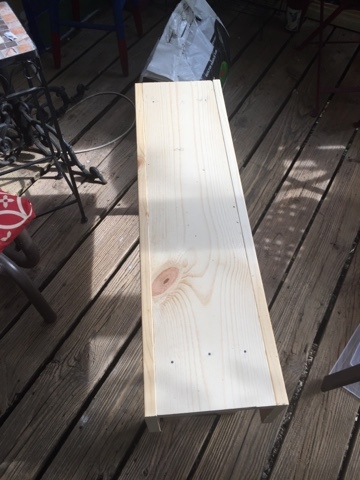 I made this to hang on the deck a couple months ago. It hangs right by the back door and the edge of the deck. My mom made this years ago but handed it down to me for my deck. I of course thought it looked cool on the door. 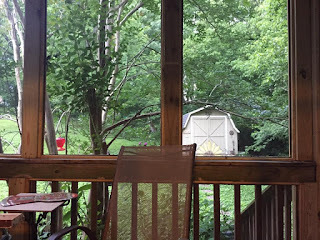 This morning I sat on my deck enjoying a cool 76 degrees and listening to the birds singing all around me. I have my trusty side kick with me as always. He is honoring Memorial Day by wearing his Red, White and Blue. To all the men and women whom have given so much to protect our country. My Dad, who gave 22 yrs of his life to the Navy. I thank you and all the others that have protected our shores. Bless you all. Have a blessed Memorial Day. 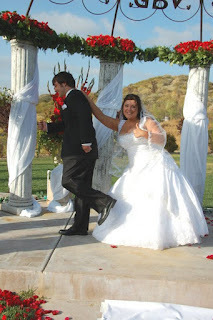 Wishing my beautiful daughter in law and my handsome son a very Happy 6th Anniversary! This morning Dakota and I sat out on the deck, it was a nice 71 cool degrees after a night of storms and rain. The birds were singing and flying around and it was so peaceful. 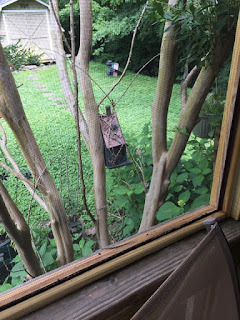 In the pic above I am standing on the deck looking into my Crepe Myrtle at the bird house I hung a couple months ago. I had been sitting there listening to this one bird that I was not sure what it was and was not sure where it was coming from. Then I saw her, on the branch next to the bird house and she was loud! She would speak out and another bird, same talk as her would speak up from in the trees on the creek. I then realized where that noise was coming from....her and him. Then I realized why. She flew from branch to branch checking things out before flying onto the bird house. And then I realized I heard babies too. I watched him and her do this for a long time. Such a pleasure. Here is mom. Waiting, looking and checking things out. Then over to the house she went.